Bottecchia is a well know brand of road bicycles that was made popular in the US in the late eighties when Greg Lemond won an epic battle against French rider Laurent Fignon in the Tour de France while riding on a Bottecchia for the ADR Cycling Team. The final individual time trial would decide the final outcome of the 1989 Tour, as the world was watching Greg Lemond make his comeback. Laurent Fignon lost the time trial and the Tour de France while Greg rode his Bottecchia time trial bike equipped with the Scott aero bars, which Laurent Fignon would forgo the use of the clip on aero bars and lost valuable seconds in the end. Long story short, the Bottecchia brand is legendary along with the riders that have ridden Bottecchia’s to victory. Bottecchia bicycles have only gotten better over the years! Bottecchia has reemerged over the last few years in the United States. This year, the SoCalCycling.com Team had the opportunity to race on the Bottecchia Doppia T2 frames/bikes and had another super solid season landing on the podium nearly every week of the 2018 race season, whether it was a road race or a fast and furious criterium. The Bottecchia Doppia T2 frame did an outstanding of job and was a fantastic all-around bike. The Bottecchia Doppia T2 is a well-balanced bike with an outstanding design and graphics package. 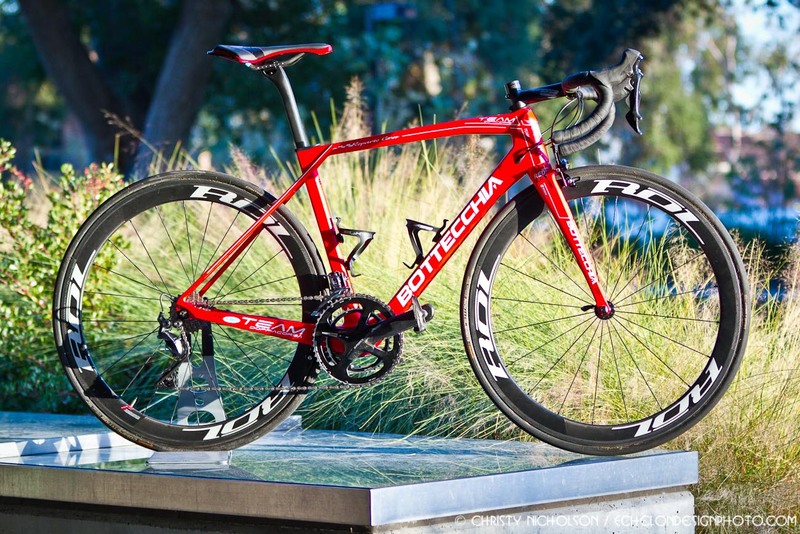 The Bottecchia Doppia T2 had nothing but rave reviews from the SoCalCycling.com Team riders. It climbed well, sprinted well and descended really well. Bottecchia did a fantastic job with the overall design. The Bottecchia Doppia T2, which is designed in Italy, has sculpted features and a unique design that just says exotic Italian all over it. The Bottecchia Doppia T2, which is a premier Italian carbon road race bike, is one of those bikes that you see in a bike shop and just want to stop and gawk at it as you imagine how cool it would be to be tearing up the roads with this bike underneath you. Make no mistake, the Bottecchia Doppia T2 bike is made for going fast. Because it’s well balanced, you can enjoy all aspects of what the Bottecchia Doppia T2 has to offer. Let’s start with the head tube. Bottecchia starts by using a titanium Bottecchia logo head badge that is embedded in the front of the head tube. Bottecchia uses a 1 1/8 top bearing and a 1 1/2 bottom bearing to give the Bottecchia Dopia T2 it’s stable and accurate steering, which gives you confidence in handling the descents. The top tube has a distinctive design with the top tube dropping just slightly a quarter of the way down to give it a slightly sloping top tube. The seat post is integrated and is semi aero. It also seems to absorb just enough of the bumps on the road, but remains stiff as well. Heading to the rear seat stays, the brakes are under the bottom bracket so it gives it a super clean look. Plus the frame features an additional Bottecchia Ti badge on the seatstay bridge where the brakes would normally fit. The chainstays are disc brake compatible if you decide to make the jump to disc brakes. The brakes are direct mount, which we’ve been using for the last couple of seasons, and they provide some of the best braking aside from disc brakes. The rear brake is located under the bottom bracket. The front fork is a straight bladed full carbon fork with a direct mount brake. Being that the fork is straight bladed it lends to the nice handling of the front end. The bottom bracket is a BB 386/86, which offers a stiff and efficient bottom bracket when you are jumping out of the saddle or standing up out of the saddle climbing and you can feel the stiffness. Here’s the big takeaway after getting some time in the saddle with the Bottecchia Doppia T2: Despite its stellar look, the Bottecchia Doppia T2 is a solid performer. It’s a well-balanced bike, and it excels in all area’s. However, this bike has aggressive handling, so it suits someone who’s going to be more on the competitive side that wants to push the limits. The Bottecchia Doppia T2 is available in a non-disc brake model as well as a full-disc brake model. You can also purchase the frameset as well or make your own custom build. See the latest line of Bottecchia bikes at Interbike at booth 2429 in the Italian Pavilion.